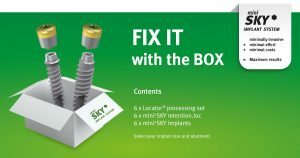 mini1 SKY implants are the perfect solution for edentulous patients with increasing bone resorption and the associated change of the soft tissue (gingiva). The 6mm mini1SKY can be used as a temporary implant to retain surgical and drilling guides by providing a fixed reference point, especially in edentulous jaws. 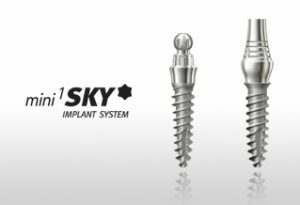 mini2 SKY implants are ideal solutions for very narrow gaps. With a diameter of 2.8mm or 3.2mm they can be a solution for even the narrowest of spaces. cost-effectiveness even for the most price conscious patients.